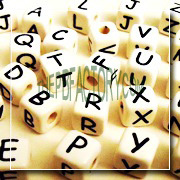 The famous Peruvian alphabet ceramic beads are not popular for no reason. They can be easily used to display affection, show support for a favorite sports team, flaunt a slogan or message or simply spell your name in personalized bracelets and neckpieces. 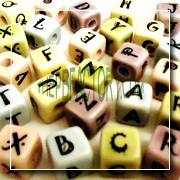 Apart from fashionable jewelry, alphabet beads can be creatively used as crafting materials for children’s art and craft projects like scrap books and customized key chains or bracelets strung on cords, laces, elastic or even plastic straws. Children are especially thrilled to be able to ‘write’ out loving, funny or other quirky things they wish to say and make enjoyable and unique gifts for their loved ones! 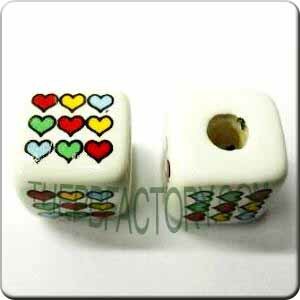 Made from best quality ceramic, you will be amazed by the wide range of sizes, colors and designs that are available. 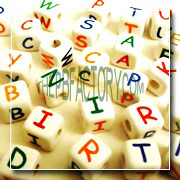 Choose from the medium-sized traditional square, white beads with black letters (A-Z) or opt for the best-selling medium-sized beads with the same alphabet printed on each side in 4 different colors – red, orange, blue and green. The latter has a variation with number 0-9 and also symbols like @, dot (.) and #1. 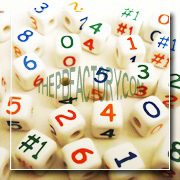 The larger sized cube beads have black letters on pastel colored beads like yellow, pink, lavender, light blue and green. 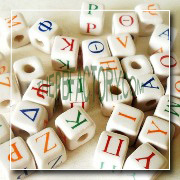 We will soon be introducing smaller size alphabet beads as well as the much-in-demand Greek alphabet beads as well.